For the performance user always having a top end system is important. I've always been very proud of the parts I used and in away it's no longer just a computer, it's my creation. Now, I work at computer store as a service tech and just about everyone these days seems to be equipping their computers with 128 MB+ RAM, so I figure, "Heck, if Joe Blow has 128 MB, I need more!" So I went shopping… I could have bought the generic 256 MB DIMM's PC-133 for $110CDN, but again, having pride in my components, I decided against equipping my machine with a weak memory subsystem. Instead I picked up some Apacer 256 MB PC-100 SDRAM. Now I know what you're saying, "what do you want PC-100 RAM for?!?" Well it's simple, I do my homework before I buy. 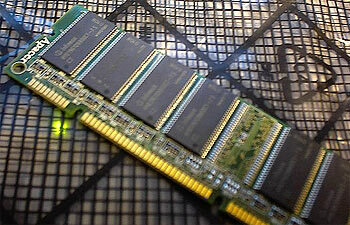 While looking over the memory available at my local computer store (not the one I work at), I noticed that these 256 MB modules were using the same DRAM as the Mushkin Rev. 3 PC-150 uses! Lucky break? You bet! Of course, the Apacer sticks were quite a bit pricier then regular generic memory. In the end I paid $280CDN for two sticks, or for the mathematically inclined $140 each. The chips were Infineon HYB39S128800CT-7.5, C2. With 512MB of memory I was satisfied in my systems status once again. I marvel at how technology has progressed. I have more ram then my old 486DX/33 (oc'ed to 40 MHz!) had hard drive space! Well back to the present. Yes, I'm being vain here, just getting more memory because I wanted more then the average person. Then again, knowing that the DRAM can run at CL2 at 150 MHz, I was really excited on how high I could clock the RAM up to.